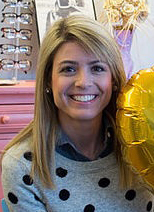 It is widely reported in our profession that independent eyecare professionals capture about 50 percent of eyewear sales across the industry, while completing 68 percent of the exams. 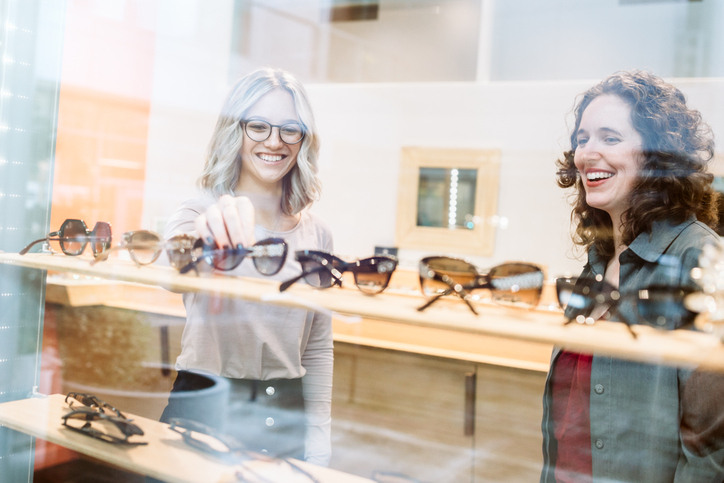 While you will always have online shoppers, three key features can improve your optical capture rate: frame and lens differentiation, merchandising and atmosphere. The trend toward online purchasing, and the threat of competition from large retail chains, is not going away. To compete with these rivals, who are much better-financed, you must find ways to make your optical stand out, and be easy and convenient to purchase from. Effective merchandising. Showcasing those frames in a way that their stories, artistry and manufacturing qualities are on display for patients and deliver value. When you bring in a new frame line, it should have a story to tell. Know the stories, and be able to convey them to your patients. In your optical, each frame line should be different and fill a different purpose. Think funky, classic, bright colors, metals, chunky or tailored. Knowing your demographics can guide you in the total numbers you should purchase from each line. Most patients tend to be conservative in eyewear taste, so if you carry 500 frames, 50 should be allocated to funky. If your patient’s are younger, go heavier on the chunky styles. This will vary per area of the country. Defining your practice mission can be helpful in selecting frame lines. For example, part of our practice’s mission is to bring the latest in technology to our patients, and to provide superior eyecare. We express this mission by selecting frame materials made of unique materials, such as drift wood, caster oil and heat/cold resistance materials developed by NASA. How does this feature help drive sales? The frames within your optical reflect the vision of your practice. For example, if giving to the community is a core value of your practice, eyewear lines with a social conscience would be a good addition. If you are committed to technological innovation, 3D-printed eyewear would enhance your inventory. If your practice recommends silicone hydrogel daily-disposable contact lenses, high-end luxury lines would be a good eyeglasses companion. Where did you get this idea? Attending Vision Expo events are the best method to see the newest and latest in unique eyewear lines. Additionally, many luxury lines can be viewed on the Luxury Eyewear Forum web site or in 20/20 magazine. How much did it cost? Creating a niche optical with frame line differentiation may cost more than buying vast quantities from a major manufacturer. 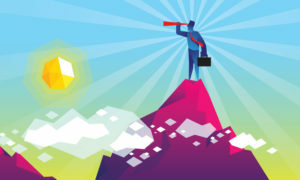 This increase in cost of goods is worth it because it is vital to becoming a destination optical. Our product differentiation sets us apart from competition and is a source of referrals. Staff training required? Send your optician lead to the Vision Expo events, so they will be excited and educated on the frames and their features. Each time you add a new optical staff member, they should be educated about each frame line by the product rep. The photo above is used on the practice’s social media. This particular line is known for its vast array of colors and shapes, and the uniqueness of each frame. The “Framed” pictures are from a book dedicated to the history and eyewear of this particular line, worn by many celebrities. I prescribe from the chair, and ask my optical staff to reiterate my lens prescription. I have found patients need this repetition, and it ensures they purchase what they told you in the exam room they intend to purchase. In my optical, I have hidden baskets of POP including Transition lenses, polarized lenses and anti-glare materials. Also included is POP distinguishing the differences in progressive lenses vs. computer lenses, and anti-fatigue lenses vs. single-vision reading glasses. Furthermore, every patient should be educated on digital lens technology. Otherwise, patients are unable to compare your lenses to the cheaper online options. They must understand they aren’t comparing apples to apples. 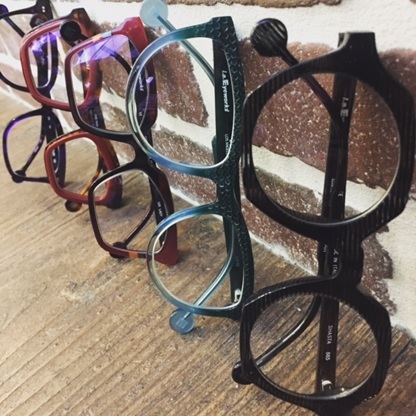 We refer to their job as custom, and explain to patients that their frame selection is factored into the way the computer generates their lens prescription. How does this feature help drive sales? Patients must understand why they should buy from you–that you are considering their needs and demands, and are producing a customized product. Online retailers do not have that ability; they are one size fits all. Where did you get the idea/how do you do it? If you as the doctor are unaware of all the lens options, ask your lab representative to give you a refresher course. Lens feature samples and POP are easily acquired from lens manufacturers. How much did it cost? These are typically free. Some samples may require small investments. Staff training required? Every optical employee should have a working script, so they are all delivering the same message. Each must know to recommend Transitions, polarized lenses and anti-reflective treatments. Furthermore, they must understand the unique characteristics of each lens type. 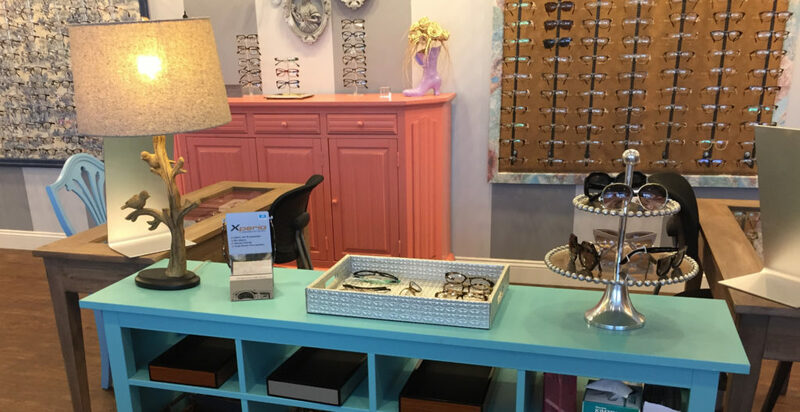 “Hidden boxes of POP,” such as the Xperio box on this counter with cards about the lens, allow Dr. Dryer and her opticians to educate patients about the quality spectacle lenses her practice sells. Merchandising is the display of eyewear in an appealing way to drive consumer interest and purchase of the product. Retail boutiques like Anthropologie and Nordstrom use minimum amounts of product, displayed in creative, yet simplistic, ways to capture your attention and make finding product easy. The best merchandising conveys a message about the product, but does not distract from the product itself. When merchandising your eyewear ask: “Is my eyewear on display, or is my merchandising on display?” Your eyewear should be the feature. How does this feature help drive sales? Merchandising is used to signal to the patient the worth of the product. Product that is displayed in locked cabinets, or unique pieces of furniture, convey higher value. Frames displayed in rows signal equality of worth. Luxury frames should be set apart as a collection, and displayed in an aesthetically pleasing way. How do you do it? Merchandising is an ever-evolving process. Your frame lines and displays should be routinely changed/updated. You want displays to feel fresh and current to patients. Ideally, when they pick up their purchased frames, you want them to be enticed to pick up an additional frame. I try to stay away from themed holiday merchandising. In a high-end optical, it can come across as cheesy. How much did it cost? The cost of merchandising can vary greatly. The more you can create yourself, the more cost-effective. Stores such as Hobby Lobby and Michaels can be great resources. Before you send you most creative staff member to one of these stores, sit down as an optical team and brainstorm. This gives your staff direction on the look and purpose of what to purchase. I would limit the staff member’s budget to $150 with specific items to purchase. In addition, Goodwill or Habitat for Humanity can often have items, such as books or planters, that can be re-purposed for little money. Staff training required? 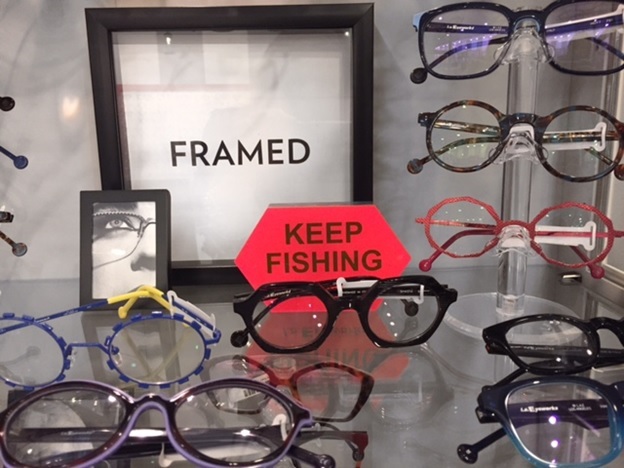 Yes, your staff must be trained on the display of your frames if they are responsible for sales. This may be best left to the creative minds in your office. 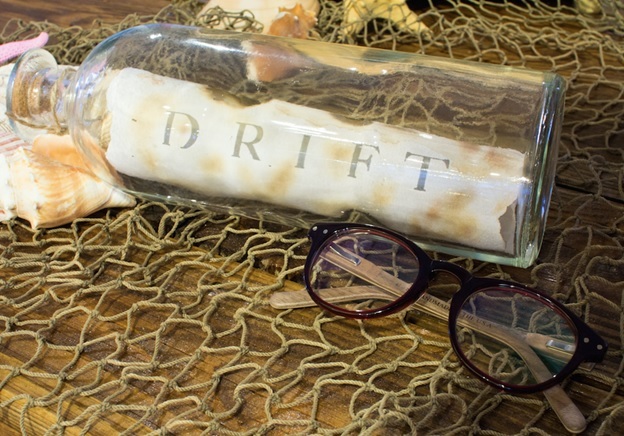 In merchandising our Drift line, the goal was to convey the idea of drift wood, but highlight the frame using a pop of color. Atmosphere includes merchandising, but it also encompasses more, including layout, temperature, smell and colors. Office layout is crucial to your sales. If your goal is to sell frames, your office should be centered by the optical. It should be the central hub. Open, elevated ceilings promote browsing and sales. Patients should make several trips through the optical on each visit. We create a warm, inviting environment with the presence of a fireplace during the winter, and a pleasing scent. The smell is one of the first aspects patients comment on. Stay away from beige walls. They create a sterile and cold atmosphere. Cool grey or blues are best to provide neutrality yet coziness. Consider adding color through merchandising, floral arrangements or a pop of color in furniture selection. How does this feature help drive sales? Atmosphere may be the most important feature to drive sales. The environment is a patient’s first impression of your practice and of you as the doctor. Great atmosphere is vital in building patient loyalty and goodwill toward your office. Patients who feel part of the practice will trust your staff’s recommendations in product options and be confident in their optical purchases. How did you do it? We were able to design our optical from scratch. For some, it may require knocking out a wall or changing colors to create a more open, warm environment. How much did it cost? Varies depending on need. Staff training required? No training needed. Dr. Dryer tries to create an atmosphere with colors, like turquoise and coral, and decorations, that show patients the practice’s sense of style.